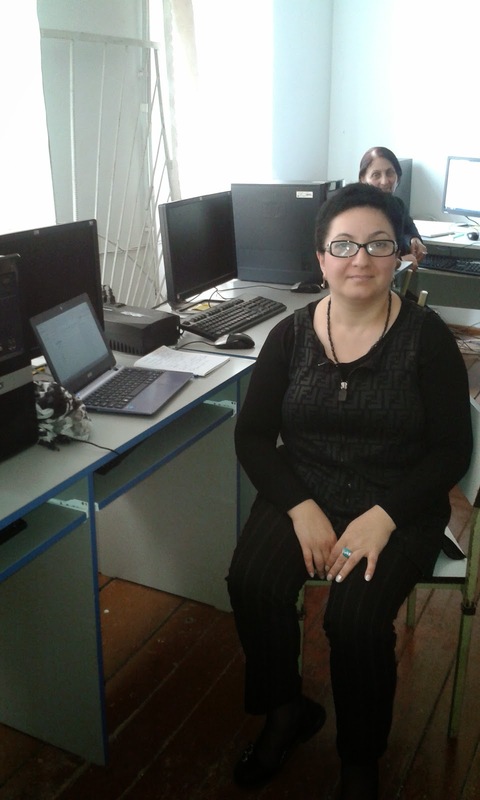 Marina Iskakova is a doctor of chemistry, professor of Kutaisi State University and at the same time teaches at a public school: “I study and teach new programs with great pleasure and use them in the studying process. First of all I increase my own level and share my skills with my students so that they can develop their 21st-century skills. I myself strive to involve them in discussions about global problems, and by linking these with my topic I encourage their initiatives and motivation. And, of course, I would be very grateful for being possible to communicate with teachers from across the globe, and share all up-to-date problems with them”. On the 8th, April a lesson of a national diplomacy and a unification of two countries of Russia and Georgia was hold in our school. 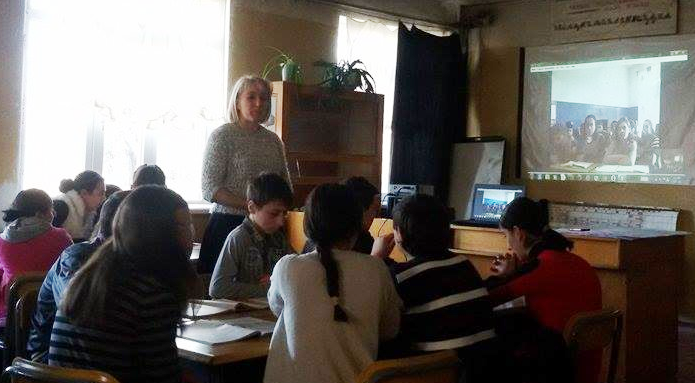 This lesson became possible because of modern technology, such as Skype in the classroom. Students in our school and a school of the city of Moscow prepared presentations about their countries, performed national dances and sang songs together and presented their national cuisines. This lesson-conference showed us how much in common our students have with their peers. 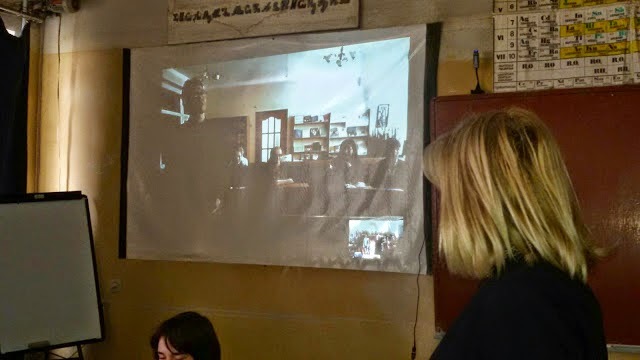 Skype in the Russian lesson. დღეს გაიმართა ხიდი საქართველოსა და კაზახეთის მოსწავლეებს შორის. ერთ-ერთ ვებინერზე, რომელიც ტარდებოდა Microsoft-ის განაათლების ექსპერტებისათვის, გამომეხმაურა რუსულად მოლაპარაკე სერგეი პავლიჩკოვმა. გავეცანი, დავიმეგობრე ფეისბუქში. მოგვიანებით გამიჩნდა იდეა ერთობლივი გაკვეთილის ჩატარებისა, სადაც შეხვდებოდნენ ქუთაისის მოსწავლეები კაზახსტანის ბავშვებს. შევსთავაზე სერგეის Skype-ის მეშვეობით გაგვეცნო ერთმანეთისათვის თავი. ორივე ქვეყნის ბავშვებისთვის საერთო სალაპარაკო ენა აღმოჩნდა რუსული და ამიტომ გაკვეთილის მომზადება ვთხოვე რუსული ენის პედაგოგებს მ.ხონელიძეს და ნ.ქატამაძეს. ისინი დიდი სიამოვნებით ჩაერთვეს ამ პროექტში. Today was the bridge between Georgia and Kazakhistan pupils. Vebiner the one who held it to Microsoft Educator Experts, replied in Russian-speaking Sergeiy Pavlyuchkov. 6 თებერვალს ჩემი და "კრიტიკული მეგობარის" ქალბატონი ნანა ცერცვაძის მრავალჯერადი შეხვედრის შედეგად დავგეგმეთ და ჩავატარეთ სამოდელო ინტეგრირებული გაკვეთილი ქიმიისა და ხელოვნების დარგში. საგაკვეთილო პროცესში ჩართული იყვნენ ქუთაისის N33 საჯარო სკოლის 8ბ კლასის (პედ. მ.ისკაკოვა) და ნახშირღელეს საჯარო სკოლის 8 კლასის (პედაგოგი ნ.ცერცვაძე) მოსწავლეები. ჩართულობა განვახორციელეთ Skype-ის მეშვეობით. გაკვეთილის თემა იყო "საღებავები და ოქსიდები", შესაბამისად ის იყო ხელოვნებასთან ინტეგრირებული, რადგან მოსწავლეებს შეექმნას წარმოდგენა ქიმიის პრაქტიკული გამაყენების თვალსაზრისით. როგორ მნიშვნელოვანია, როდესაც მასწავლებელი (პედაგოგი) არის სიახლის ძიებაში. სამი დღის განმავლობაში უნებლიეთ გავეცანი უამრავ უახლეს პროგრამას, რომელიც სასარგებლო იქნება სასწავლო პროცესის განვითარებისათვის. პროგრესი არ დგას!!! ტექნოლოგიები მუდმივად განვითარდება. იყო მომენტი, როდესაც მეგონა, რომ შევისწავლე ყველაფერი, შეიძლება მოხდეს მხოლოდ ძველის განახლება. მაგრამ სინამდვილემ დამიდასტურა საპირისპირო. 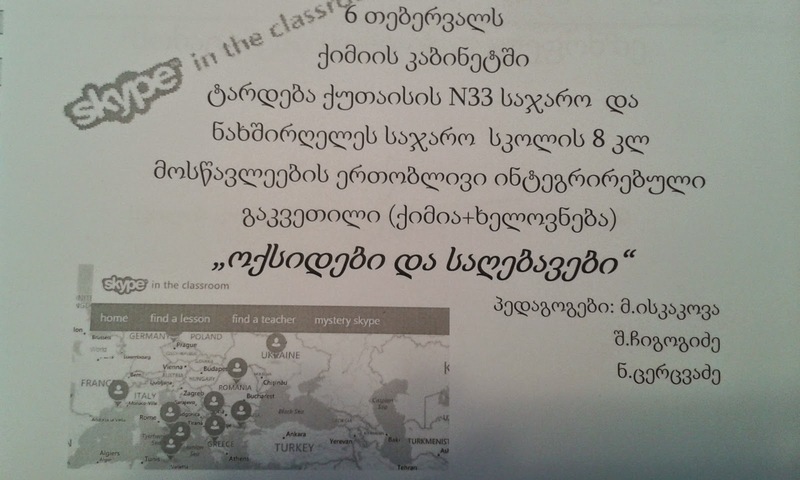 მე, როგორც Microsoft Innovative Educator, მასწავლებლების გლობალური გაერთიანებიდან მომდის პერიოდულად დავალებები, მიტარდება ონლაინ ჩართვები, კონფერენციები, გავდივარ პროფესიული განვითარების კურსებს, შესაბამისად მომიხდა სიახლეებთან შეხება. ვერ ვიტყვი, რომ ყველა პროგრამა მისაღებია ჩვენს სივრცეში, მაგრამ ბევრი საინტერესოა. ერთ-ერთ მათგანზე მინდა მოგიყვეთ დღეს. I teach chemistry in Public school and in State University. I actively use technology in the learning process. This makes learning fun for the students. They develop the skills of the 21st century. They are attached to the communication technology. My skills I bring to school Colleges, spend trainings, seminars. I create video tutorials and guides on specific topics. 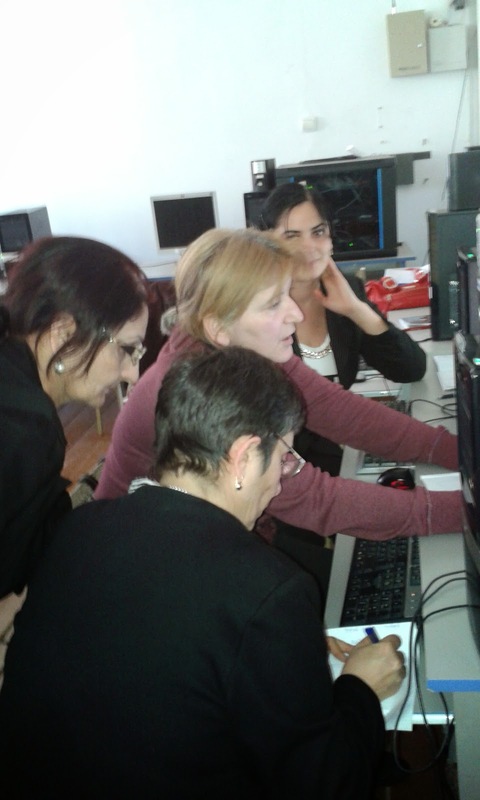 Teachers Georgia with great pleasure visiting my seminars. It helps me and I feel that they need. ქუთაისის N 33 საჯარო სკოლაში ჩამოვაყალიბეთ სკოლის განვითარების ჯგუფი. ჯგუფში გაერთიანებულია საგნობრივი კათედრების მიერ არჩეული წარმომადგენლები. სკოლის განვითარების ჯგუფს ჩავუტარე ტრენინგი "ელექტრონული პორტფოლიოს შექმნა, მართვა და გამოყენება". ეს ხელს შეუწყობს შესაბამისი უნარ-ჩვევების განვითარებას კათედრების დანარჩენ წევრებს შორის.